AIG On the Go is now here! To have the best viewing experience of AIG On the Go real time statistics tracking, please rotate your device to landscape mode and view this page on your desktop. Error- server is not currently available. Check out AIG On the Go's New Driving Focus Feature! 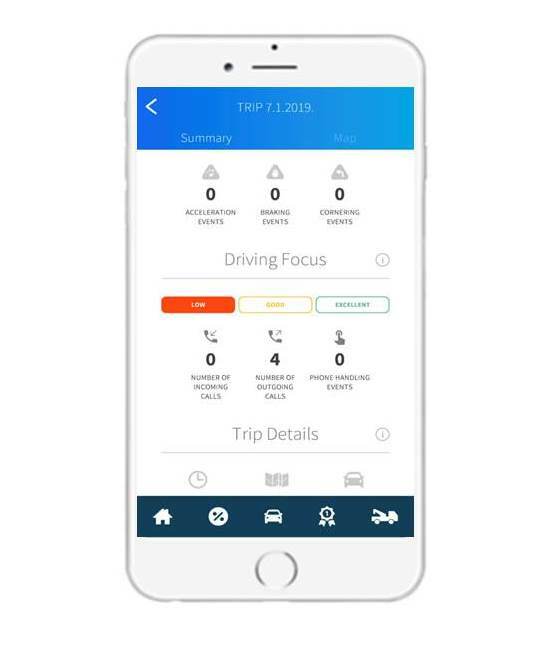 The driving focus feature evaluates the amount of attention you, as a driver, pay to your main task of driving versus the various distractions in your immediate surroundings. One of the biggest distractions is your mobile phone. For your safety and the safety of your passengers and other road users, you should refrain from having any interactions with your mobile phone whilst driving. AIG Singapore’s “Best Driver in Singapore”, Zuo Quan, receiving his prize from Claudia Salem, Chief Executive Officer, Singapore and Head of Country Operations, Southeast Asia. 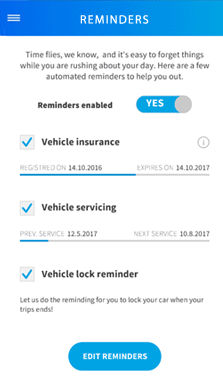 AIG is proud to introduce AIG On the Go: The Intelligent Driving App for Singapore. AIG On the Go is our way of raising greater awareness about safer driving and encouraging more drivers, like yourself, to translate safer driving into dollar savings. Using telematics, AIG On the Go will score your driving performance against certain key driving parameters, such as acceleration, speed, braking and cornering. Based on that score, AIG will offer you up to 15% off your AIG vehicle insurance premium. You can also participate in fun contests like competing against other driving enthusiasts in Singapore and stand a chance to win amazing prizes. As long as you have a motor vehicle registered to your name in Singapore and record your every drive, you can participate in every contest that the app has to offer! If you are not an AIG customer but are interested in AIG's auto insurance products, do call us at 6419 3000 to find out more. Save up to 15% off your next vehicle insurance renewal with safer driving! How does the new discount structure work? Discounts can be accumulated over a maximum period of 12 months. For example, if you unlock the base discount in January 2018, you will be able to accumulate the discounts till December 2018. 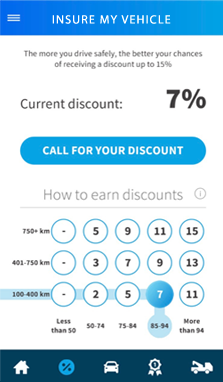 Record a minimum of 500 kilometres to unlock the base discount of 5%. Subsequently, each time you record the kilometres stated in the table, your discount will increase by an additional 2%. Note: You must maintain a driving score of at least 90 points for each recorded trip. What happens to my current discount which I have successfully unlocked based on the previous discount structure? If your current discount is between 1% and 5%, under the new discount structure, you will have unlocked the base discount of 5%. You will have unlocked the base discount (5%). You will have unlocked the base discount (5%) and the subsequent discount (2%) which brings your total discount to 7%. You will have unlocked the base discount (5%) and the subsequent discounts (4%) which brings your total discount to 9%. You will have unlocked the base discount (5%) and the subsequent discounts (6%) which brings your total discount to 11%. You will have unlocked the base discount (5%) and the subsequent discounts (8%) which brings your total discount to 13%. You will have unlocked the base discount (5%) and the subsequent discounts (8%) which brings your total discount to 15%, which is the maximum discount. Where can I find my current discount? Your current discount is displayed on the discount screen of the AIG On the Go app. More detailed information is shown in the boxes representing individual months and the base discount. There you can see if the base discount has been unlocked and by how much the total discount has increased over the months. Is it possible to lose a discount that I have already unlocked? No, once you unlock a discount, it is yours to keep even if your safety driving score goes under 90 points. When you have successfully unlocked your discounts, you can claim your discount by clicking on “Call For Your Discount” or call us at 6419 3000. What are the mystery gift boxes which are shown at the discount structure? Once you have unlocked the maximum 15% discount, you are able to unlock a mystery reward gift. For example, we have S$12 off Honestbee vouchers, S$10 Han’s Cafe vouchers and many more vouchers up for grabs! AIG Celebrates 100 Years in 2019. To commemorate this milestone in Singapore, we have a Centennial contest for all you drivers out there! Do you have what it takes to be one of the top drivers in the AIG Centennial Top 100 Drivers Contest? Sign up for the AIG Centennial Top 100 Drivers Contest and see who the best drivers in the house are! Simply register for the contest through AIG On the Go. AIG On the Go will track and tabulate each driver's trip score (minimum score of 80) from 18 January 2019 to 18 July 2019. 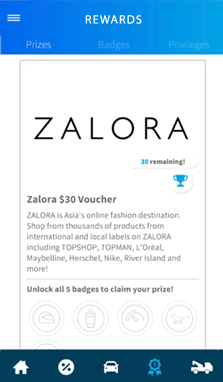 At the end of this period, the top 100 drivers with a minimum score of 80 per trip who individually record a minimum total distance of 3,000 km, will each receive S$50 worth of shopping vouchers! Do you have what it takes to be the one of the top drivers in the Private Hire Car Drivers Contest? 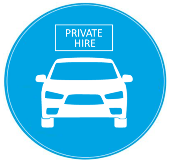 Sign up for the "Private Hire Car Drivers Contest" and see who the best drivers in the house are! Simply register for the contest through AIG On the Go. AIG On the Go will track and tabulate each driver's average score from 17 September 2018 to 17 January 2019. At the end of this period, the top 100 drivers with the highest average score who individually record a minimum total distance of 3,000 km, will each receive a customised AIG CashCard with S$50 stored value (and perpetual bragging rights!). Do you have what it takes to be one of the top drivers in the Roads.sg Champion Drivers 2018 contest? Sign up for the Roads.sg Champion Drivers 2018 contest and see who the best drivers in the house are! Simply register for the contest through AIG On the Go. AIG On the Go will track and tabulate each driver's average score from 16 May 2018 to 16 September 2018. At the end of this period, the top 100 drivers with the highest average score who individually record a minimum total distance of 2,500 km, will will each receive a customised AIG CashCard with S$50 stored value (and perpetual bragging rights!). Do you have what it takes to be one of the top drivers in the MINI Penang & KL Getaway Contest 2018? Sign up for the MINI Penang & KL Getaway Contest 2018 and see who the best drivers in the house are! The contest is open from 26 May to 29 May 2018. During this period, AIG On the Go will tabulate your average score. At the end of the contest period, the 1st, 2nd and 3rd top driver will each receive Caltex Cards worth S$300, S$200 and S$100 respectively and the winners will be announced by Eurokars Habitat! 50% NCD Vehicle Owners vs Non-50% NCD Vehicle Owners – Who are the Safer Drivers? Sign up for “50% NCD Vehicle Owners vs Non-50% NCD Vehicle Owners – Who are the Safer Drivers?" Team Contest to settle the score once and for all! Simply register for the contest through AIG On the Go and select your team, i.e. 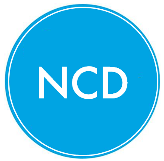 join either the 50% NCD Vehicle Owners or Non-50% NCD Vehicle Owners team. AIG On the Go will track and tabulate each team’s average score from 15 February 2018 to 15 May 2018. At the end of this period, the team with the highest average score will win the contest. The top 100 drivers from the winning team, who individually record a minimum total distance of 1,500 km, will each receive a customised AIG CashCard with S$50 stored value (and perpetual bragging rights!). Small (up to 1,600cc) vs Big (above 1,600cc) Vehicle Owners – Who are the Safer Drivers? Does the capacity of the vehicle you drive determine your driving skills? Sign up for the “Small (up to 1,600cc) vs Big (above 1,600cc) Vehicle Owners – Who are the Safer Drivers?” Team Contest to settle the score once and for all! Simply register for the contest through AIG On the Go and select your team, i.e. join either the Small (up to 1,600cc) or Big (above 1,600cc) vehicle team. AIG On the Go will track and tabulate each team’s average score from 4 September to 3 December 2017. At the end of this period, the team with the highest average score will win the contest. The top 100 drivers from the winning team, who individually record a minimum total distance of 1000 km, will each receive S$50 worth of Dairy Farm Vouchers (and perpetual bragging rights!). Do you have what it takes to be the best driver in Singapore? From 1 March to 30 June 2017, the driver with the overall highest driving score during this period will receive the title of AIG’s “Best Driver in Singapore” and win these great prizes! Does the make of the vehicle you drive determine your driving skills? Sign up for the “Japanese vs Korean vs Continental Vehicle Owners – Who are the Safer Drivers?” Team Contest to settle the score once and for all! Simply register for the contest through AIG On the Go and select your team, i.e. join either the Japanese, Korean, or Continental vehicle owners’ team. AIG On the Go will track and tabulate each team’s average score from 8 June to 7 September 2017. At the end of this period, the team with the highest average score will win the contest. The top 100 drivers from the winning team, who individually record a minimum total distance of 1,000 km, will each receive Caltex Cards each with a S$50 stored value (and perpetual bragging rights!). Do you have what it takes to be the top drivers in HomeTeamNS? Sign up for the HomeTeamNS Top Drivers Contest and see who the best drivers in the house are! Simply register for the contest through AIG On the Go and key in the password provided by HomeTeamNS to you. The contest is open from 15 June to 14 September 2017. During this period, AIG On the Go will tabulate your average score. At the end of the contest period, the top 20 drivers will receive a S$50 Dairy Farm voucher each! Winners will be announced by HomeTeamNS! Does your generation determine your driving skills? Sign up for the “Baby Boomers vs Gen X vs Gen Y – Who are the Safer Drivers?” Team Contest to settle the score once and for all! Simply register for the contest through AIG On the Go and select your team, i.e. join either the Baby Boomers (born in 1943 – 1960), Gen X (born in 1961 - 1980) or Gen Y (born in 1981 - 1995). AIG On the Go will track and tabulate each team’s average score from 3 May to 2 July 2017. At the end of the contest, the team with the highest average score will win the contest and the top 10 drivers from the winning team will each receive Caltex Cards with a total of S$50 stored value (and perpetual bragging rights!). Does your gender determine your driving skills? Sign up for the “Men vs Women – Who are the Safer Drivers?” Team Contest to settle the score once and for all! Simply register for the contest through AIG On the Go and select your team, i.e. join either the men or women's team. AIG On the Go will track and tabulate each team’s average score from 1 March to 30 April 2017. At the end of the contest, the team with the higher average score will win the contest and the top 50 drivers from the winning team will each receive a customised AIG CashCard with S$50 stored value (and perpetual bragging rights!). Do you have what it takes to be one of the top drivers in the MINI Kuantan Getaway Contest? Sign up for the MINI Kuantan Getaway Contest and put your driving skills to the test! Simply register for the contest through AIG On the Go and key in the password “AIGMINI2017”. The contest is open from 22 July to 24 July 2017. During this period, AIG On the Go will tabulate your average score. At the end of the contest period, the 1st, 2nd and 3rd top driver will each receive Caltex Cards worth S$300, S$200 and S$100 respectively! The winners will be announced by Eurokars Habitat! 1.1 The AIG Centennial Top 100 Drivers Contest is organised by AIG Asia Pacific Insurance Pte. Ltd. (“AIG”). 1.2 The Contest will start on 18 January 2019 and end on 18 July 2019, both days inclusive (“Contest Period”). The latest date you can enter the Contest is 17 July 2019 (see “How to Participate” for further details). You must be at least 18 years of age or older, when you enter the Contest. You must not be an employee of AIG or any AIG affiliated company. You must comply with all requirements imposed by the Land Transport Authority on private hire car drivers from time to time. 1.4 All prizes are not transferable or exchangeable for cash, credit or kind. AIG reserves the right to replace the prizes with other items of similar value without prior notice. All prizes are subject to the manufacturer’s terms and conditions. AIG shall not be responsible for the quality or fitness for purpose or any other aspects of the prizes. 1.5 AIG reserves the right to terminate the Contest or vary, delete or add to any of these terms and conditions from time to time without notice. 1.6 AIG shall not be liable in any manner for any claims, losses, damages, liabilities or expenses arising out of or relating to, the Contest or prizes. 1.7 By participating in the Contest, the participants agree to be bound by the terms and conditions herein. 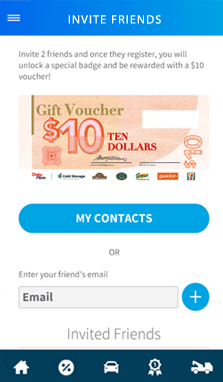 The top 100 drivers with a minimum of 80 per trip who individually record a minimum total distance of 3,000 km, will each receive S$50 worth of shopping vouchers. 1. How do I enter and compete in this Contest? a) First, download the AIG On the Go app via Apple's App Store or Google's Play Store and register to use it. b) Fill in the information required in the “Personal Information” section of the app. The information is necessary, as it enables us to verify that you meet the minimum eligibility criteria for the Contest. Once you have completed a) and b), click on “CONTESTS” in the app, select the “AIG Centennial Top 100 Drivers Contest”. c) Please note that during the Contest Period, your score and first name will be displayed on the public scoreboard of AIG On the Go. d) Every time you get behind the wheel, AIG On the Go will score your driving performance for that trip. Each score you receive will count towards your overall score for the Contest Period. e) You must only use the vehicle you have registered with AIG On the Go for this Contest. f) A trip only counts in the Contest if it is a trip which has taken place within Singapore. 2. What if more than one participant has the same score at the end of the Contest? If more than one participant has recorded the same score at the end of the Contest, we will determine the winners based on the one who has travelled the most distance, followed by the most number of trips recorded during the Contest Period. (or if the participants still have equal scores) the least harsh cornering. 3. Who is the judge? The decision is based on the metrics of the AIG On the Go app. In the event of any dispute, AIG’s decision will be final and binding. AIG reserves the right to disqualify any individual at any time who, in AIG’s sole opinion, behaves fraudulently or misleadingly or in a manner which prejudices the fairness and integrity of the Contest. 4. When will the results of the Contest be announced? Winners will be notified via email by September 2019. There will be no re-sending of the email. Winners will have to comply with the redemption procedure(s) set out in the email. 1.1 The "MINI Penang & KL” Getaway Contest is organised by AIG Asia Pacific Insurance Pte. Ltd. (“AIG”) and Eurokars Habitat. 1.2 The Contest will start on 26 May 2018 and end on 29 May 2018, both days inclusive (“Contest Period”). The latest date you can enter the Contest is 28 May 2018 (see “How to Participate” for further details). You must hold a valid Singapore driving licence. You must be a participant of MINI Penang & KL Getaway Contest 2018 organised by Eurokars Habitat. The motor vehicle you register when you enter the Contest must be registered in your name. You do not have to be an AIG customer to participate in the Contest. The 1st, 2nd and 3rd top driver will each receive Caltex Cards worth $300, $200 and $100 respectively and the winners will be announced by Eurokars Habitat! Winners will be based on the highest score with the most distance travelled. a) First, download AIG On the Go app via Apple's App Store or Google's Play Store and register to use it. 2. What if the average score for both teams is exactly the same at the end of the Contest Period, i.e., it is a draw? Eurokars Habitat will announce the results of the contest and the winners will be notified at the end of the contest. 1.1 The Private Hire Car Drivers Contest is organised by AIG Asia Pacific Insurance Pte. Ltd. (“AIG”). 1.2 The Contest will start on 17 September 2018 and end on 17 January 2019, both days inclusive (“Contest Period”). The latest date you can enter the Contest is 16 January 2019 (see “How to Participate” for further details). The top 100 drivers who individually record a minimum total distance of 3,000 km for this contest will each receive a customised AIG CashCard with S$50 stored value. b) Fill in the information required in the “Personal Information” section of the app. The information is necessary, as it enables us to verify that you meet the minimum eligibility criteria for the Contest. Once you have completed a) and b), click on “CONTESTS” in the app, select the “Private Hire Car Drivers” Contest. Winners will be notified via email by March 2019. There will be no re-sending of the email. Winners will have to comply with the redemption procedure(s) set out in the email. 1.1 The "Roads.sg Champion Drivers 2018" contest is organised by AIG Asia Pacific Insurance Pte. Ltd. (“AIG”) and Roadfly Pte. Ltd. (“Roadfly”). 1.2 The Contest will start on 16 May 2018 and end on 16 September 2018, both days inclusive (“Contest Period”). The latest date you can enter the Contest is 15 September 2018 (see “How to Participate” for further details). The top 100 drivers who individually record a minimum total distance of 2,500 km for this contest will each receive a customised AIG CashCard with S$50 stored value. b) Fill in the information required in the “Personal Information” section of the app. The information is necessary, as it enables us to verify that you meet the minimum eligibility criteria for the Contest. 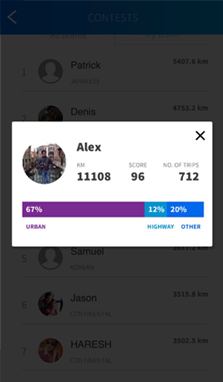 Once you have completed a) and b), click on “CONTESTS” in the app, select the “Roads.sg Champion Drivers 2018” Contest. Winners will be notified via email by November 2018. 1.1 The “50% NCD Vehicle Owners vs Non-50% NCD Vehicle Owners – Who are the Safer Drivers?” Team Contest is organized by AIG Asia Pacific Insurance Pte. Ltd. (“AIG”). 1.2 The Contest will start on 15 February 2018 and end on 15 May 2018 (“Contest Period”). The last date you can enter the Contest is 14 May 2018 (see “How to Participate” for further details). You must be a Singapore resident. The top 100 drivers from the winning team, who individually record a minimum total distance of 1,500 km, will each receive a customised AIG CashCard with S$50 stored value. AIG shall not be liable in any manner for any claims, losses, damages, liabilities or expenses arising out of or relating to, the Contest or the Gift. AIG reserves the right to replace the Gift with other items of similar value without prior notice. The Gift is subject to the respective manufacturer’s terms and conditions. AIG shall not be responsible for the quality or fitness for purpose or any other aspects of the Gift. AIG reserves the right to terminate the Contest or vary, delete or add to any of these terms and conditions from time to time without notice. a) First, download the AIG On the Go app from the App Store or Google Play Store and register to use it. b) Fill in the information required in the “Personal Information” section of the app. The information is necessary, as it enables us to verify that you meet the eligibility criteria for the Contest. Once you have completed a) and b), click on “CONTESTS” in the app, select the “50% NCD Vehicle Owners vs Non-50% NCD Vehicle Owners – Who are the Safer Drivers?” Team Contest and join a team. c) Please note that during the Contest Period, your score and first name may be displayed on the public scoreboard of AIG On the Go if you are one of the top 100 drivers in the Contest. d) Every time you get behind the wheel, AIG On the Go will score your driving performance for that trip. Each score you receive will count towards your overall score for the period of the Contest. In this scenario, the team with most distance travelled will be the winning team. Winners will be notified via email by June 2018. 1.1 The “Small (up to 1,600cc) vs Big (above 1,600cc) Vehicle Owners – Who are the Safer Drivers?” Team Contest is organised by AIG Asia Pacific Insurance Pte. Ltd. (“AIG”). 1.2 The Contest will start on 4 September 2017 and end on 3 December 2017 (“Contest Period”). The last date you can enter the Contest is 2 December 2017 (see “How to Participate” for further details). The top 100 drivers from the winning team, who individually record a minimum total distance of 1000 km, will each receive S$50 worth of Dairy Farm Vouchers. b) Fill in the information required in the “Personal Information” section of the app. The information is necessary, as it enables us to verify that you meet the eligibility criteria for the Contest. Once you have completed a) and b), click on “CONTESTS” in the app, select the “Small (up to 1,600cc) vs Big (above 1,600cc) Vehicle Owners – Who are the Safer Drivers?” Team Contest and join a team. c) Please note that during the Contest Period, your score and first name will be displayed on the public scoreboard of AIG On the Go if you are one of the top 100 drivers in the Contest. AIG will announce the results of the Contest sometime in January 2018 on its website at www.aig.com.sg and the winners will be notified via email. 1.1 The Best Driver in Singapore Contest is organised by AIG Asia Pacific Insurance Pte. Ltd. (“AIG”). 1.2 The Contest will run from 1 March 2017 and end on 30 June 2017 (“Contest Period”). The last date you can enter the Contest is 30 June 2017 (see “How to Participate” for further details). You must not be an employee of AIG or any affiliated company. Free Fuel for one year valued at S$5,000 + Car Spa vouchers worth S$2,000 + a customised AIG CashCard with S$3,000 stored value. The prizes cannot be converted to cash or other products and is non-transferrable. b) Fill in the information required in the “Personal Information” section of the app. The information is necessary, as it enables us to verify that you meet the eligibility criteria for the Contest. Once you have completed a) and b), you are automatically enrolled in the “Best Driver in Singapore Contest”. c) Please note that during the course of the Contest, your score and first name will be displayed on the public scoreboard of AIG On the Go if you are one of the top 3 drivers in the Contest. f) You have to record a minimum total distance of 100 kilometres on AIG On the Go for the Contest Period. Otherwise, you will not be eligible for the Contest. g) A trip only counts in the Contest if it is a trip which has taken place within Singapore. 2. How do I win? At the end of the Contest Period, if you have the highest overall score amongst all the participants in the Contest, you will be our Grand Winner! 3. What if more than one participant has the same score at the end of the Contest? If more than one participant has recorded the same score at the end of the Contest, we will determine the winner based on the one who has travelled the most distance, followed by the most number of trips recorded during the Contest Period. 4. Who is the judge? In the event of any dispute, AIG’s decision will be final. AIG reserves the right to disqualify any individual at any time who, in AIG’s sole opinion, behaves fraudulently or misleadingly or in a manner which prejudices the fairness and integrity of the Contest. AIG’s discretion is absolute and its decision is final. 5. When will the results of the Contest be announced? AIG aims to announce the results of the Contest in July 2017 on its website at www.aig.com.sg, and the individual winner will be notified via email. 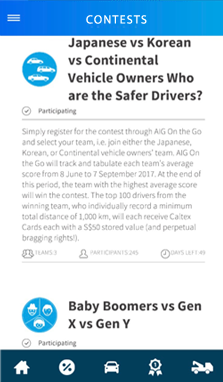 1.1 The “Japanese vs Korean vs Continental Vehicle Owners – Who are the Safer Drivers?” Team Contest is organised by AIG Asia Pacific Insurance Pte. Ltd. (“AIG”). 1.2 The Contest will start on 8 June 2017 and end on 7 September 2017 (“Contest Period”). The last date you can enter the Contest is 6 September 2017 (see “How to Participate” for further details). The top 100 drivers from the winning team, who individually record a minimum total distance of 1,000 km, will each receive a Caltex Card with a S$50 stored value. b) Fill in the information required in the “Personal Information” section of the app. The information is necessary, as it enables us to verify that you meet the eligibility criteria for the Contest. Once you have completed a) and b), click on “CONTESTS” in the app, select the “Japanese vs Korean vs Continental Vehicle Owners – Who are the Safer Drivers?” Team Contest and join a team. 2. What if the average score for all three teams is exactly the same at the end of the Contest Period, i.e., it is a draw? AIG will announce the results of the Contest sometime in October 2017 on its website at www.aig.com.sg and the winners will be notified via email. 1.1 The HomeTeamNS Top Drivers Contest is organised by AIG Asia Pacific Insurance Pte. Ltd. (“AIG”) and HomeTeamNS. 1.2 The Contest will start on 15 June 2017 and end on 14 September 2017, both days inclusive (“Contest Period”). The latest date you can enter the Contest is 13 September 2017 (see “How to Participate” for further details). You must be a HomeTeamNS member. The top 20 drivers with the highest average score during the Contest Period will receive a S$50 Dairy Farm voucher each. The voucher will be issued to the top 20 drivers by HomeTeamNS. b) Fill in the information required in the “Personal Information” section of the app. The information is necessary, as it enables us to verify that you meet the minimum eligibility criteria for the Contest. Once you have completed a) and b), click on “CONTESTS” in the app, select the “HomeTeamNS Top Drivers Contest” and key in the password provided to you by HomeTeamNS. 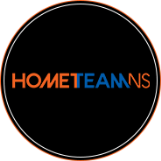 HomeTeamNS will announce the results of the Contest by October 2017 on its website and the winners will be notified via email or phone. 1.1 The “Baby Boomers vs Gen X vs Gen Y – Who are the Safer Drivers?” Team Contest is organised by AIG Asia Pacific Insurance Pte. Ltd. (“AIG”). 1.2 The Contest will start on 3 May 2017 and end on 2 July 2017 (“Contest Period”). The last date you can enter the Contest is 1 July 2017 (see “How to Participate” for further details). The team with the highest average score will be the winner, and the top 10 drivers from the winning team will each receive Caltex Cards with a total of S$50 stored value. b) Fill in the information required in the “Personal Information” section of the app. The information is necessary, as it enables us to verify that you meet the eligibility criteria for the Contest. Once you have completed a) and b), click on “CONTESTS” in the app, select the “Baby Boomers vs Gen X vs Gen Y – Who are the Safer Drivers?” Team Contest and join a team. 2. What if the highest average score for both teams is exactly the same at the end of the Contest Period i.e. it is a draw? In this scenario, the top 10 drivers in each team will each receive Caltex Cards with a total of S$50 stored value. AIG aims to announce the results of the Contest in August 2017 on its website at www.aig.com.sg and the winners will be notified via email. 1.1 The “Men vs Women – Who are the Safer Drivers?” Team Contest is organised by AIG. 1.2 The Contest will run from 1 March 2017 and ends on 30 April 2017 (“Contest Period”). The last date you can enter the Contest is 30 April 2017 (see “How to Participate” for further details). 2.1 The team with the higher average score will be the winner, and the top 50 participants from the winning team will each receive a customised AIG CashCard with S$50 stored value. b) Fill in the information required in the “Personal Information” section of the app. The information is necessary, as it enables us to verify that you meet the eligibility criteria for the Contest. 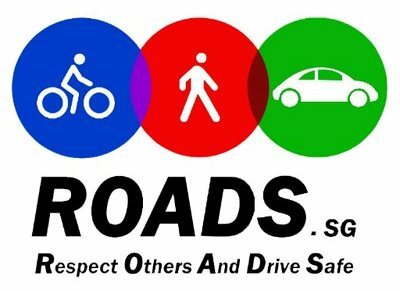 Once you have completed a) and b), click on “CONTESTS” in the app, select the “Men vs Women – Who are the Safer Drivers?” Team Contest and join a team. 2. What if the average score for both teams is exactly the same at the end of the Contest Period i.e. it is a draw? In this scenario, the top 50 participants in each team will each receive a customised AIG CashCard with S$50 stored value. AIG aims to announce the results of the Contest in July 2017 on its website at www.aig.com.sg and the winners will be notified via email. 1.1 The MINI Kuantan Getaway Contest is organised by AIG Asia Pacific Insurance Pte. Ltd. (“AIG”) and Eurokars Habitat. 1.2 The Contest will start on 22 July 2017 and end on 24 July 2017, both days inclusive (“Contest Period”). The latest date you can enter the Contest is 24 July 2017 (see “How to Participate” for further details). You must be a participant of MINI GETAWAY 2017 organised by Eurokars Habitat. The 1st, 2nd and 3rd top drivers with the highest average score will each receive Caltex Cards worth S$300, S$200 and S$100 respectively. The winners will be announced by Eurokars Habitat. Winners will be based on the highest average score with the most distance travelled. b) Fill in the information required in the “Personal Information” section of the app. The information is necessary, as it enables us to verify that you meet the minimum eligibility criteria for the Contest. Once you have completed a) and b), click on “CONTESTS” in the app, select the “MINI Kuantan Getaway Contest” and key in the password "AIGMINI2017". f) A trip only counts in the Contest if it is a trip which has taken place within Singapore and Malaysia. Eurokars Habitat will announce the results and notify the winners at the end of the Contest. Congratulations to the Women's Team on winning the “Men vs Women – Who are the Safer Drivers?” Team Contest! Analysed data shows for a fact that on weekends, the activity levels of our Contest participants (accumulated distance and trips recorded) were lower than on weekdays. The data also shows that the activity levels increase in the middle of the week, particularly on Wednesdays and Thursdays. Analysed data again shows that on weekends, contributors of challenge had lower activity that resulted with smaller number of generated trips on weekends while during a middle of a week, most trips were generated, especially on Wednesdays and Thursdays. Click here to view the list of FAQs.